And I also have a step by step picture tutorial below. First, adhere the webbed ribbon to a card stock by using Ranger Multi Medium Matte. Use Daisy Day's shining adhesive paper lace. I love the shining silver color so much! Cut out the pattern papers and then choose a word stamp to stamp on the papers with Ranger Archival Ink (color-Sepia). A closer look of stamping effect. Ink the edges using Ranger Distress Ink (color-Vintage Photo). Adhere the star with scraps using Daisy Day Sweet Tape. P.S. What is Sweet Tape? 500pcs of double sided tape in a box container that already cut into pieces of 0.5 inch, just pull out for using. Next, staple the folded chiffon to the background paper. 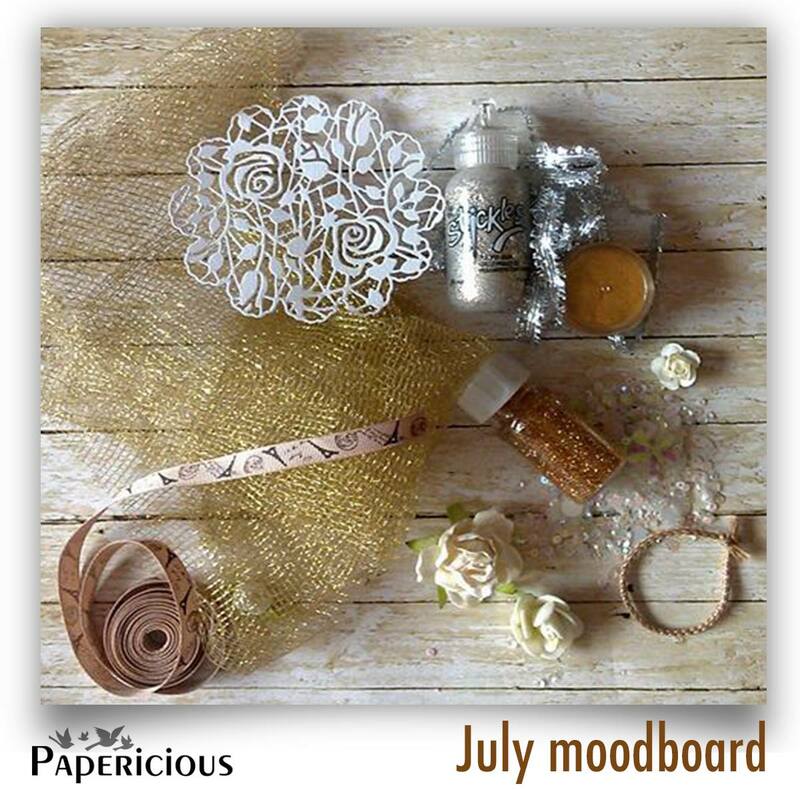 Layer all the scraps and decorate with a word sticker and a paper flower. Apply these Ranger's products to give the card some dimensional look. 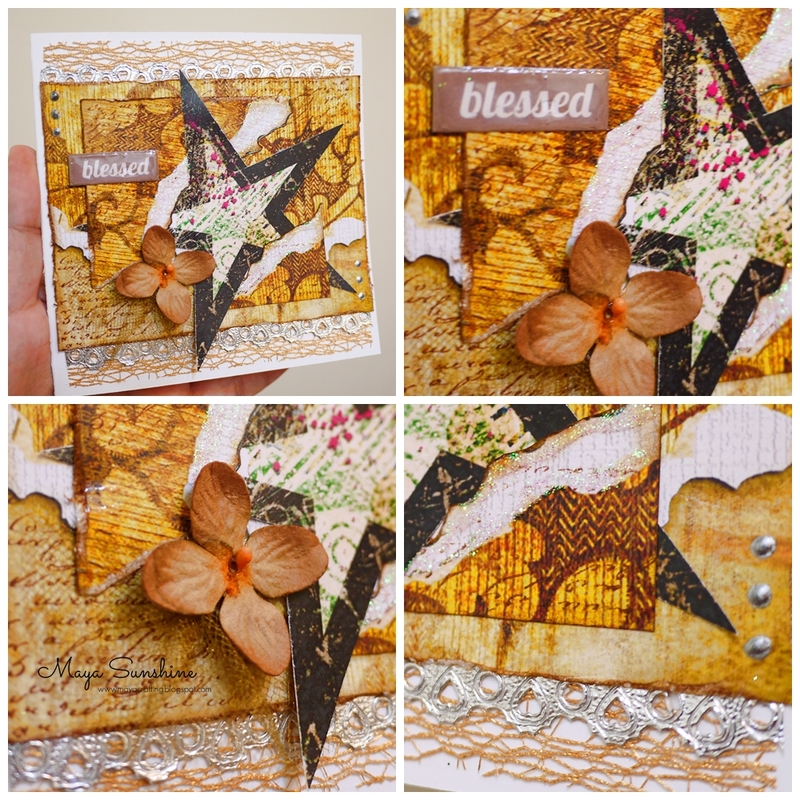 I use Ranger Glossy Accents to the "blessed" sticker, Liquid Pearls (color-Pewter) to create the silver dots, Stickles (color-crystal) to the scraps. Here are some close ups and details of the card. Thanks for stopping by and for all your sweet comments. Have a good weekend!